The state of manufacturing in India is maturing, leading to a gradual but steady shift from “Manufacturing for low-cost” to “Design and manufacturing”. Due to the growing competition with global suppliers, and manufacturers of end products, there is an increasing demand to improve quality (tighter dimensional and form tolerances, hybrid surface texture parameters), reduce cycle time (shorter turn-around time), more flexibility (smaller batches), while at the same time reducing the production costs. Grinding is a versatile material removal and surface generation process. It has a wide range of applications in the metal-cutting industry where high precision or low surface roughness along with comparatively high material removal rates and lower costs are required. In its most common application sector – the automobile industry, it comes under the realm of finishing processes for various automobile shaft components. One of the ways in which the industry has progressed to meet the new challenges is to shift towards super-abrasives – particularly Cubic Boron Nitride (CBN) and consequently a grinding system that can exploit the features and benefits of CBN grinding. CBN, being more than twice as hard regular Aluminum oxide retains its cutting edges better against wear during grinding and therefore allows to cut at higher material removal rates. Moreover, CBN has a higher thermal conductivity, almost 55 times than Aluminum oxide. This helps to reduce the heat transferred to the work-piece during grinding and therefore results in a better profile of residual stresses on the work-piece and reduces chances of burn. Generally, CBN results in a G-ratio (volume of work material removed for a unit volume of the wheel) more than 10-50 times that of a conventional aluminum oxide wheel. The project has been organized as a Concept to Commercialization (C2C) project. The program was initiated by Dr K (Subbu) Subramanian within the company to inculcate an entrepreneurship culture in the execution of product development projects. It holistically considers all aspects of a project at the planning stage itself – starting from market survey, product specification to the implementation and generation of sales revenue. The feasibility would be evaluated for every potential case and the conversion to CBN would be offered if there is at-least 30-50% reduction in cycle time and (or) at-least 20-50% reduction in total cost per component. I am responsible primarily for project as the project manager and specifically contributing to develop the CBN process know-how and proving out various applications. I’m also involved in the design and testing of the machine tool. The experiment was done at uni and counter direction of dressing at different overlap ratios (OLR) to study the effect of dressing on the process parameters and component quality. 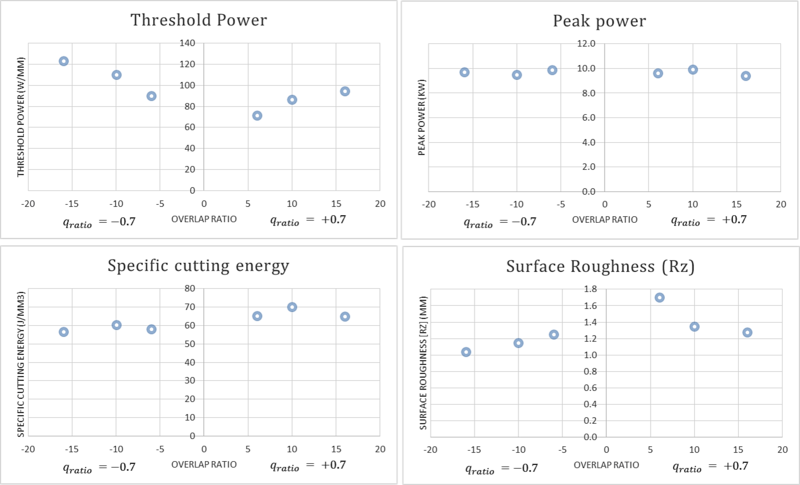 The peak power, specific cutting energy doesn’t change much while the threshold power shows a trend – higher as OLR increases and higher for counter direction of dressing. Peak power decrease shows wheel opening which is typical of CBN. 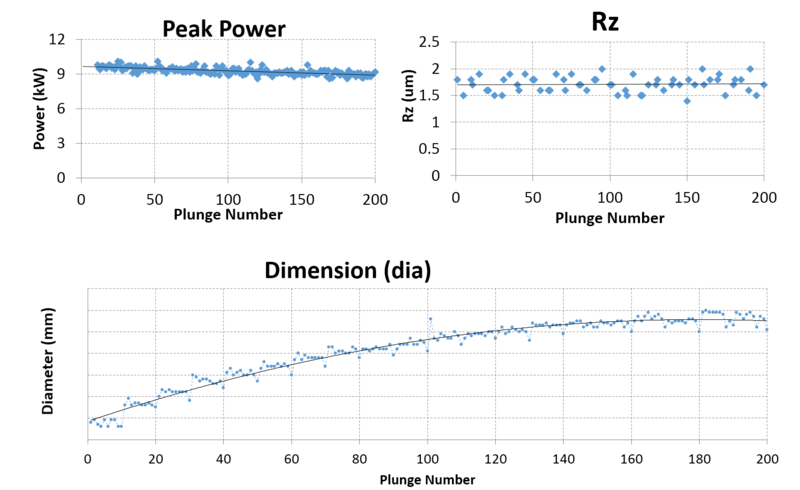 Rz is maintained in a narrow band of 0.5 um Rz. Part size shows a gradual increase primarily coming due to the drift of the axes and the spindle. Established the specifications for the machine based on market study. Evaluated various machines available in the market for such applications. The building of the second version of the CBN machine is underway. The first prototype is under modification for cam grinding with CBN and testing the programming of the non-round grinding software.